When I first began blogging, I wanted to be anonymous. It took me a long time to comment on others’ blogs and then I even used the blogonym, Eliot. I liked the anonymity. Then I started connecting. I “met” people that I really liked. If we had been geographically closer, we would have been great friends. I really wanted to live next door to them, sharing recipes and borrowing cups of sugar and drinking cups of tea in each others’ gardens. One of these friends is Aimee at From Chapel Hill to Chickenville. I originally became acquainted with Aimee through SRC. I thought she was hilarious and her blog was one of the first that I commented on using my real name, Debra. Aimee is why I am writing this morning. She has had some family difficulties lately. Her father was diagnosed with cancer earlier this year and her father-in-law suffered a car accident. Now, as Aimee puts it, the straw that has broken the camel’s back has been placed. Her beautiful two-year-old daughter, Abigail, has been diagnosed with kidney cancer. Please, please, please send lots of good thoughts and prayers to Aimee and her family in this time of need. I just can’t imagine what they are all going through. Please let her know that we are all thinking about her. You can keep up with Abigail’s recovery at http://www.caringbridge.org/visit/abigailmc. You can post a comment on Aimee’s blog here. My proposal? Besides sending thoughts and prayers up daily, let’s send Abigail and Aimee some virtual flowers. If you could snap a photo of your favorite spring and summer flowers and post a little thought to Abigail on your blog, we could let them know how much we are thinking about them. Aimee, please tell Abigail that these are lilacs and heirloom yellow “mini” roses from my garden. 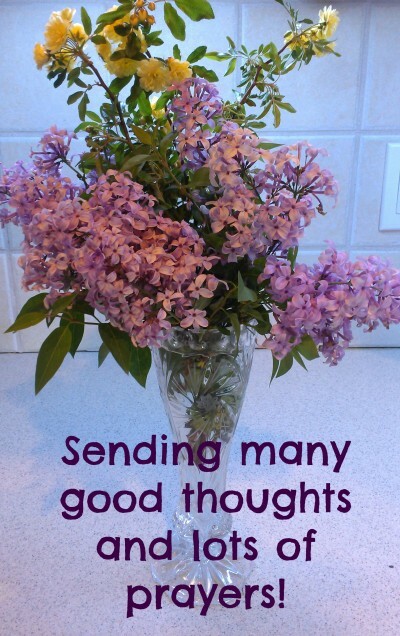 I am sending you both LOTS of good thoughts, positive energy, and prayers daily. Oh my gosh – I can’t imagine. Let me see if I can find a picture of some flowers or find some to take a picture of so I can send my positive thoughts her way. Thanks for letting us know. Thanks for posting this to FB. If not flowers, post one of your creative crafts/foods. Your Peeps come to mind. 🙂 They make everyone smile. How sad! And such a nice thing to suggest. Beautiful post. Thank you, John. Yes, it is sad but I hope they do not give up hope and remain positive. Oh Debra… thank you so much for posting. I’ve seen Aimee’s blog and you are right about how wonderful it is. What a wonderful idea to send the virtual flowers!! We will do it. Thanks, Kim. I am glad you are going to post. I cannot even begin to fathom Aimee’s position, you are a beautiful person to send her virtual flowers. I will be sure to go down and support her. Thanks, Uru. That is just it—I don’t think any of us can imagine. I cried when I read about Aimee and her baby daughter. I will put her in my prayer’s as I also have a 39 year old son that has brain cancer. So I know what she is going through. Tell her not to give up God is very powerful. Love and prayer’s to Aimee and her baby daughter. Just heartbreaking! I wondered about the devestating news you mentioned in a comment on my blog–now I know. Abigail is such a gem, I will pray for her full recovery. I know your prayers will mean a lot to them. Thank you for this. As a person who likes to serve others, receiving is hard. This past week has shown me receiving can be a blessing too. The flowers are beautiful and Abby loved them. Receiving is hard. Please accept all these thoughts and prayers for you, Abigail and your family. o my..it broke my heart to read about Aimee and her 2-year old daughter…it’s really hard to see this happen to a little gal. You are a dear friend, Debra, thoughtful and sweet. I just know things will be OK. Thanks for commenting, Angie. Thank you for commenting, C.J. My heart goes out to Aimee and her family. I will keep them in my prayers. That is nice of you to post this for them. Thank you for remembering them, Suzie. Thanks, Liz. It’s time to rally. I am a mother, I can totally understand the pain of that mother. This is something that should never happen to anyone. My prayers are with this family. It does obviously make one wonder why. I have heard a lot about Caring Bridge, very good organization. I had a friend who posted there and it was inspiring to watch him deal with the cancer treatments and also to see the support he received. What heart breaking news indeed. It’s awful for anyone to get cancer (I have had it twice) but when a child gets it. Damn, life is just not fair. Thanks for sharing that I will pop over and leave some love. So sad, just visited Aimiee. Thanks for sharing. Thanks for bringing this to our attention Darlin! Aimee and all of her family will be in my thoughts and prayers. You just brought a tear to my eye. I’ll have to go snap a picture for her, what a tough time. I will definitely send positive energy her way.